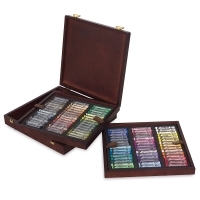 Available in a variety of great sets, Rembrandt Soft Pastel sticks are unsurpassed in their purity and intensity. The sets are beautifully gift packaged with foam inserts. Choose colorful cardboard boxes or exquisite hardwood boxes with brass hardware. Landscape sets have more blues and greens, while portrait sets have more earth and flesh tones. Dark Color sets include shades of popular Rembrandt pastel colors that were previously available only as tints. Set of 90, Portrait, Wood Box — Packaged in a luxurious wood box with a padded foam interior, this set includes a selection of carefully chosen portrait colors. Set contents found in the Item Specs Tab. 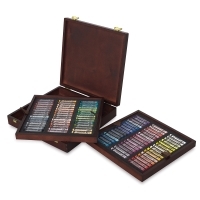 Set of 90, Landscape, Wood Box — Packaged in a luxurious wood box with a padded foam interior, this set includes a selection of pastels chosen specifically for landscape paintings. Set contents found in the Item Specs Tab. Half Stick Sets — Rembrandt offers you twice as many colors for your money with half sticks. They use the same formula as the full-size pastels, and are carefully packaged in cardboard boxes with foam inserts. Half sticks are 1-3/8" (35 mm) long and are unwrapped. Available in general selection sets. Rembrandt pastels are made from the purest pigments and mixed with the finest quality kaolin clay binder. No pigments containing heavy metals, such as cadmium, lead, and cobalt, are used in production which ensures that the pastels have no hard bits or sharp edges.